Club Villamar - Splendid holiday home Villa Romana for an unforgettable holiday experience! Why do people choose Villa Romana? Hard to say! Breathtaking sea view, 14 persons ample space, Wifi, shared tennis court, large pool and terraces, airconditioning, barbecue.... What is there not to like? Do you want to enjoy an unforgettable experience during your holiday? Booking the splendid holiday home Villa Romana is the first step to reach your goal. Our thousands of guests have never regretted their choice! Villa Romana, completely renovated in late 2017, offers you everything you need to enjoy a perfect stay with 14 people. Indoors, you’ll delight in all the comfort you can imagine, and the outside will impress you even more. Just imagine yourself on a lounger beside the pool holding a glass of Sangria in your hand and watching the hills and the Mediterranean Sea during the sunset hours. This could become your little evening ritual if you book this splendid holiday home on the Costa Brava. Sunsets here are magnificent. In addition to it, during your stay in Villa Romana, on the Costa Brava, you’ll be ensured of having countless leisure possibilities. You’ll be located at only a few kilometres of Lloret de Mar’s city centre and of the charming fisher’s village Tossa de Mar. Moreover, in less than an hour, you’ll reach plenty of other cultural and historical spots, besides bigger cities like Gerona (in Catalan: Girona) or Barcelona. Our aim is for you to be happy and enjoy your private pool, a nice and tasty meal made on your barbecue grill, your shared tennis court (with Villa Rosanna only) and, most of all, for you to enjoy your fantastic views over the Mediterranean Sea and the hills. This type of holiday has all the ingredients to make you happy! Who wouldn’t want to have his own holiday villa, and for such an affordable price? Be (you and your family or friends) our next clients and enjoy the privilege of spending your holidays in Villa Romana at only 3.300 metres of the beach! Villa Romana We’re glad to be your guide on the search of the perfect holiday, because we just want the best for you! If your desire is to enjoy a relaxing holiday, but at the same time being close enough to the centre, we would strongly advise you to rent Villa Romana. But you’re not the only one interested in this villa, before booking it, check its availability, and book it before someone else does. Location in Lloret de Mar: Follow the main road going from Lloret de Mar to Tossa de Mar, till you see the sign of the urbanization La Riviera. Turn left. In a few minutes, you’ll arrive at this splendid villa, which is located on top of the urbanization’s hill. About the villa: Parking is easy! When you arrive at your perfect holiday home, you’ll be able to park your car(s) on your property. Once out of the vehicle, you’ll find your amazing pool on the front of the villa. In the villa’s area, you’ll also find a large garden with grass, a barbecue grill and a big table next to the pool where you can enjoy a nice meal all together with great views on the Mediterranean Sea. If you’re a sport-lover, you’ll probably love the tennis court you share with the neighbouring villa, Villa Rosanna (which is also in our selection of holiday homes). Villa Romana is the perfect holiday home for those who want to enjoy fully of the open-air life style on the Costa Brava. In this holiday home, our clients don’t have time to get bored! 1st floor (entrance): This villa’s entrance is located on the first floor. First of all, on the right, there’s a toilet with a washbasin. If you continue further, you’ll find a living room (with airconditioning/heating) with a modern, fully equipped, open kitchen. This kitchen is really state of the art, with a Silestone counter top and excellent appliances. Just think of all the great meals that will be prepared here. On this floor, you’ll also be able to access the huge terrace and 32m2 pool with color lighting. Isn´t that great, just walk to your pool on the same level as your living area? You will be amazed by the sea- and coastal-views. It really is one of the best views we offer on our website. The livingroom is equipped with a large TV with international channels. Of course the villa is equipped with Wifi. 2nd floor: There are 4 rooms on this floor (each with airconditioning/heating) with 2 individual beds each one. 2 Of the bedrooms on this floor have sea view, 2 have mountain view. There are also 2 modern bathrooms on this floor, both with a toilet, washbasin and shower. Ground floor: Here you will find 2 bedrooms, both with airconditioning/heating. One has 2 double beds and one has 2 single beds. You will also find a large bathroom with toilet, wash basin and shower on this floor. From this floor you can easily reach the lawn next to the villa. You’ll find modern style decoration all over the villa. The inside of the villa is very luminous and warm, so you’ll feel at home in the blink of an eye. Villa Romana is the perfect villa to spend you sunny holidays on the Costa Brava, with family or friends! Villa Romana is the holiday residence that makes all your wishes come true. You'll have all the facilities you need for a perfect holiday with your family and/or friends. It’s an ideal combination of luxury, comfort and beach life! The use of airconditioning is optional at an extra charge. Just let us know while making a reservation. A holiday villa near the center of Lloret de Mar opens the gate to many interesting opportunities. This seaside holiday resort is known for its energetic nightlife. But Lloret de Mar has also a total different side to discover. Did you know Lloret de Mar is very famous among families, culture, art and nature lovers? Yes, Lloret de Mar is good for everybody's taste! Imagine, in the morning you'll shop till you drop. For lunch you'll taste the traditional Catalan cuisine, followed by a lazy moment on the beach. And another day you'll discover the Triangle of Dalí or get more to know about a larger city as Gerona (Catalan: Girona) or Barcelona. Always hired Villas. Worse ever due to raw sewage smell made us feel ill. Came home a week earlier could not stand the sickness due to the methane gases. Burnt candles to try and reduce the gases. Not recommended. 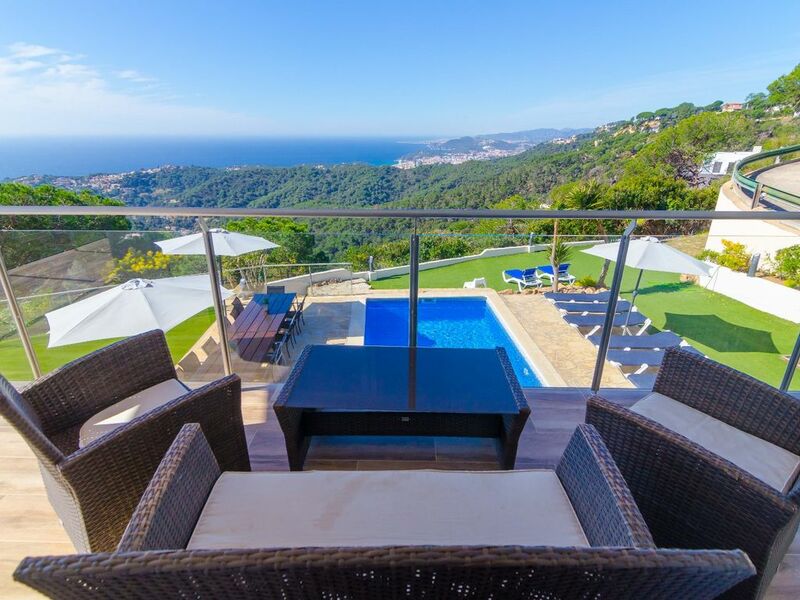 A holiday villa near the center of Lloret de Mar opens the gate to many interesting opportunities. This seaside holiday resort is known for its energetic nightlife. But Lloret de Mar has also a total different side to discover. Did you know Lloret de Mar is very famous among families, culture, art and nature lovers? Yes, Lloret de Mar is good for everybody's taste! Imagine, in the morning you'll shop till you drop. For lunch you'll taste the traditional Catalan cuisine, followed by a lazy moment on the beach. And another day you'll discover the Triangle of Dal���������� or get more to know about a larger city as Gerona (Catalan: Girona) or Barcelona.